Below is a quote from the Fantagraphics webpage for CREEPING DEATH FROM NEPTUNE, a collection of Basil Wolverton's weird scifi tales. This and the SPACEHAWK book have been in the making for ages. It seems 2012 will finally be the year these come out. Though Wolverton is known to the 60s and 70s generation as the artist who drew ugly and weird caricatures in Mad Magazine, Plop! and Topps Cards, many years before, he did more straightforward scifi/adventure/horror comics. Basil Wolverton’s work refuses to die. Following a well-received exhibit of original art in New York City’s Gladstone Gallery (which The New York Times called “exuberantly grotesque”) came 2009’s publication of The Wolverton Bible (Fantagraphics Books). Though his comic book work has been reprinted endlessly, it has either been “modernized” with digital colors or presented in austere black and white. The time has come for a robust volume of Wolverton’s comics taken from their original printed source — the comic books themselves. A pioneer from the first generation of comic book artists, Wolverton arrived just as publishers began embracing original material, turning away from the newspaper-strip reprints that had been sustaining the industry since its inception four years earlier. 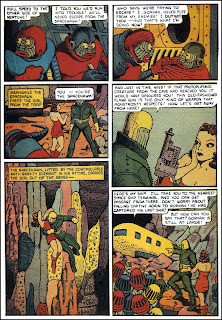 One of the first to realize the value of “in-house” features was Centaur Publications, whose art director Lloyd Jacquet gave Wolverton his big break in comics in 1938, accepting “Meteor Martin” for Amazing Man Comics and “Space Patrol” for Amazing Mystery Funnies. Jacquet soon established an independent comics packager, Funnies, Inc., for which he asked Wolverton to invent a new science-fiction character. The artist came up with the iconic “Spacehawk,” who made thirty appearances in Target Comics. 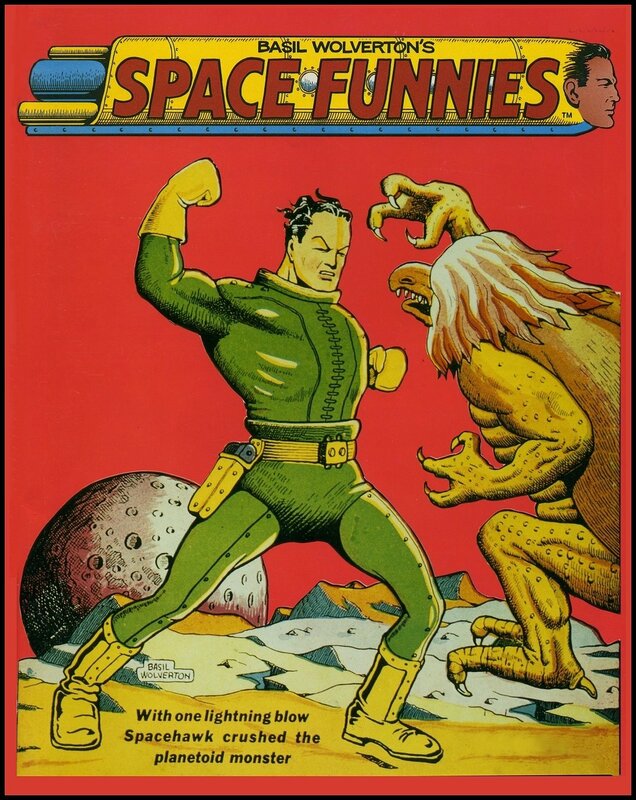 Prime examples of Wolverton’s iconic space hero will be featured in Creeping Death from Neptune. Fed up with the publisher’s constant meddling with “Spacehawk,” Wolverton dropped his creation in 1942 and concentrated on humorous features for the rest of the decade. 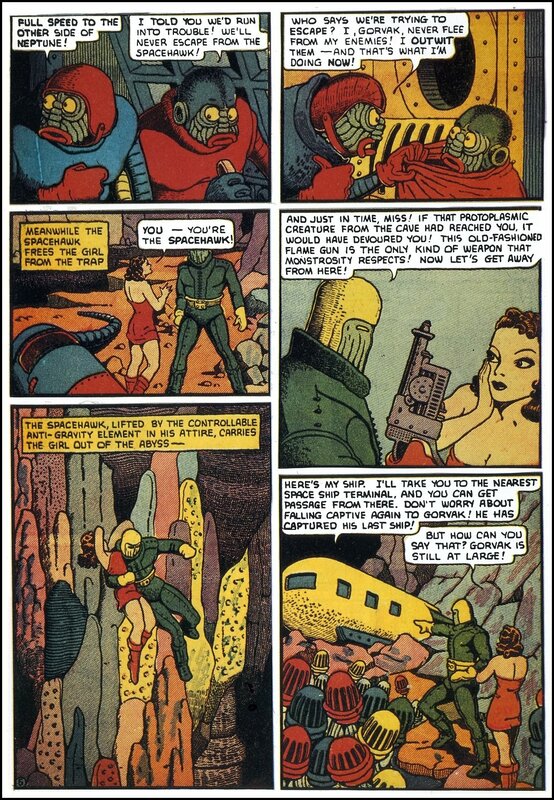 His short-lived return to serious subjects in 1951 resulted in some of the most intense horror and science-fiction stories of the pre-code era, including the classics “Brain Bats of Venus,” “Escape to Death,” and “Robot Woman,” all of which appear in this volume. Created with the full cooperation of the Wolverton estate, Creeping Death from Neptune will also examine, for the first time, the artist’s personal ledgers and diaries, shedding new light on his working methods and his day-to-day life as a freelance comic book artist. The digital restoration of the printed art will be performed with subtlety and restraint, mainly to correct registration and printing errors, with every effort made to retain the flavor of the original comic books. Both volumes will be full color and both are on preorder through amazon.com. You can check out (preview) three SPACEHAWK stories at Golden Age Comics. Artist Francesco Francavilla has quietly become one of the most dynamic and speedy artists in comics as seen from his work in DC Comics’ Detective Comics, plus Marvel’s Black Panther: Man Without Fear and the current Captain America & Bucky arc, and even regular covers for Dynamite Entertainment. And now he’s spreading his wings with a story of his own as he writes and draws a three part pulp-noir story in the pages of the prestigious anthology Dark Horse Presents. Scheduled to launch in April’s Dark Horse Presents #11, the three-part story Night Shift follows the Italian artist back into the world of his enigmatic hero Black Beetle and the crime-ridden burgh of Colt City. Francavilla first explored this hero and his world in an ashcan preview for a still-unreleased graphic novel as well as a webcomic short, but this venture in Dark Horse Presents poses his biggest platform yet, and possibly the beginning of a new future for Black Beetle. Newsarama spoke with the artist about Black Beetle and this anthology story, as well as his ambitions for writing and drawing comics both here and at Marvel and DC. Newsarama: Francesco, you’ve written comics before, but never on this big of stage – what’s it like to be able to do it here at Dark Horse Presents and now with your own creation, the Black Beetle? Francesco Francavilla: I have written short stories here and there for a few anthologies, but this is definitely a new experience for me in terms of structure (longer story, divided in three acts) and audience, and I am very thrilled and thankful for the opportunity. As someone who has still lots of stories to tell, I consider this debut in Dark Horse Presents to be very important and possibly something that could set a new path for my future career as a full-on storyteller. Nrama: For people that may be following you to this from your Marvel and DC work, who is Black Beetle? Check out the full interview at Newsrama! Check out Francesco's online comic of BLACK BEETLE here. 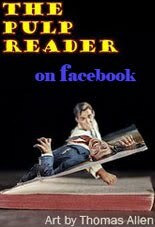 Don't forget to "like" The Pulp Reader on Facebook. There's plenty going on over there too!